Does it really matter where you live in retirement? People have all kinds of motivations for relocating – or staying put – in retirement. You may wish to live near the kids and grandkids, relax in the sun, or relocate to that hassle-free condo right in the middle of all the urban action. But before you make a final decision about where to put down roots, check out what you’ll pay in state taxes. After all, your state of residence will affect the taxes you pay in retirement, especially after recent tax law changes. Although many people are expecting their federal tax bill to drop, they may be shocked to learn that taxes in some states could actually go up, explains Sandra Block, in an article for Kiplinger’s. Kiplinger’s surveyed the tax burdens you’ll face in all fifty states once you retire. 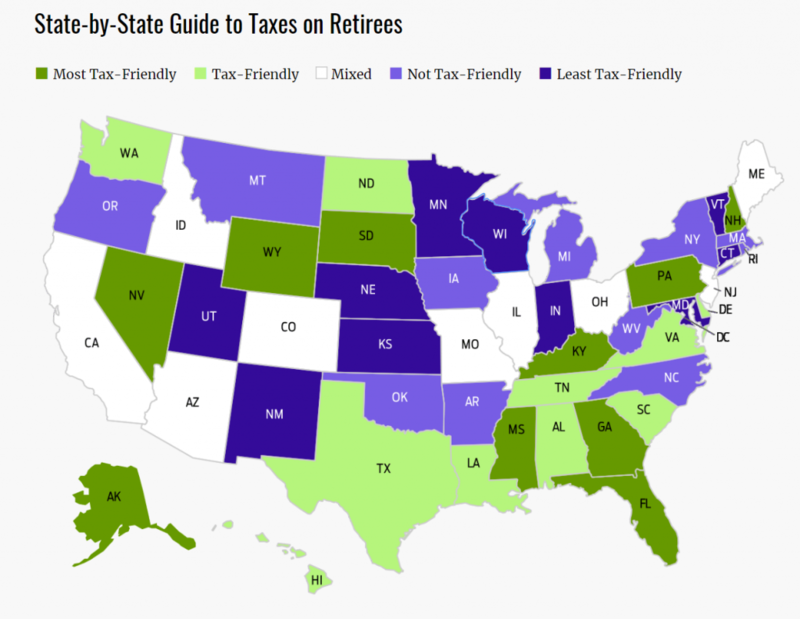 Not surprisingly, Florida was one of the most tax-friendly states (shown in green on the chart). Among the least tax-friendly states (shown in purple), Minnesota, Maryland, Connecticut, and Indiana are among those that will cost you the most. “Moving from a pricey part of the country to one with low housing prices could lower your expenses and make your retirement savings last longer,” suggests Block. Keeping that state tax burden low will also boost your buying power and help your money go farther. For Kiplinger’s interactive map showing the tax burden state-by-state, click here.